In this warp speed, digitized world of email, SMS, search engines and e-everything, it’s hard to imagine sitting down and writing an old-fashioned letter to an aging parent, relative, or other loved one. Not a quick, digital note through Outlook, but a good old pen-and-paper letter, even a postcard. Truth be told, many seniors don’t even use email – they don’t even own a computer. Shocking as that may seem to someone not of “a certain age,” we have to remember there are still significant numbers of people alive who were born in the first decades of the 20th century, before there was even television. If you think a little bit, you can probably come up with the names of at least several people you know to whom the Internet is a complete mystery. If you know someone like this who may be in a nursing home, assisted living facility, or fortunate to be able to remain in their own home, they’d love to hear from you. And the best thing you can do is write them a letter. Even seniors unfamiliar with email and digital communication realize that it takes time and effort to write a letter. Make no mistake — they’ll feel the love that went into that letter and appreciate it beyond words. Digital communications such as email and text messages get lost in an avalanche of electronic files. But a physical letter is a thing forever, something that will be carefully put away and looked at again and again. Long after that last email has disappeared, your loved one will pull out that shoebox, carefully reread your letters, and treasure the memories they have created. They can calm troubled minds. Everyone needs reassurance and kind words now and then. 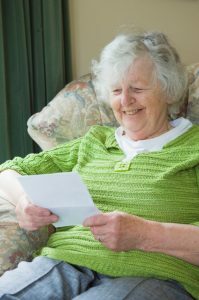 For a senior who may be lonely and longing for contact, your letters will be a gentle reminder that someone loves them and is thinking about them. Letter-writing causes you to focus your thoughts and consider words in a way that reflexively typing at a computer keyboard cannot. A blank sheet of paper requires no electricity and offers no distractions. It begs to be filled with your thoughts, feelings, and ideas – things your elderly loved one would be delighted that you’ve shared with them. So the next time you’re thinking of getting in touch with someone you love who might not be connected to a network, it’s okay to go ahead and call them. But then, sit down and write them a letter. You cannot overestimate how much that will mean to them. This entry was posted in Caregivers, Tips and tagged keep in touch, letter-writing, mail a letter, seniors. Bookmark the permalink. Both comments and trackbacks are currently closed.